← June 1 – The lost has been found! I can remember the old Honolulu Airport, where we could walk up to the chain link fence to either say “aloha ʻoe” or “aloha!”, depending on whether someone was leaving or arriving. I have a photo of two of my siblings and I standing barefoot, next to our lei-decked papa-san at that fence, the plane he was going to fly in just on the other side. Of course, back in those days, there were no commercial jets… ho, makes me feel so makule, yeah? They were all prop planes. 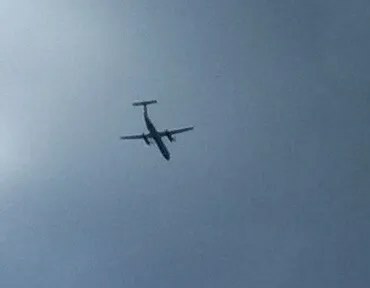 So today, when I heard a plane flying over, I knew it wasn’t a jet, and quick as a wink I snapped this photo on my cell phone. We were all so happy when our papa-san came home again, once again bedecked with fragrant lei.